Listing date must be between July 1, 2018 and September 30, 2018. Closing date must be no later than March 31, 2019. Property Type must be Single Family Residential/Stick Built. Property must be located in Douglas County or Carson City. $1,000 instant rebate paid upon home closing escrow. 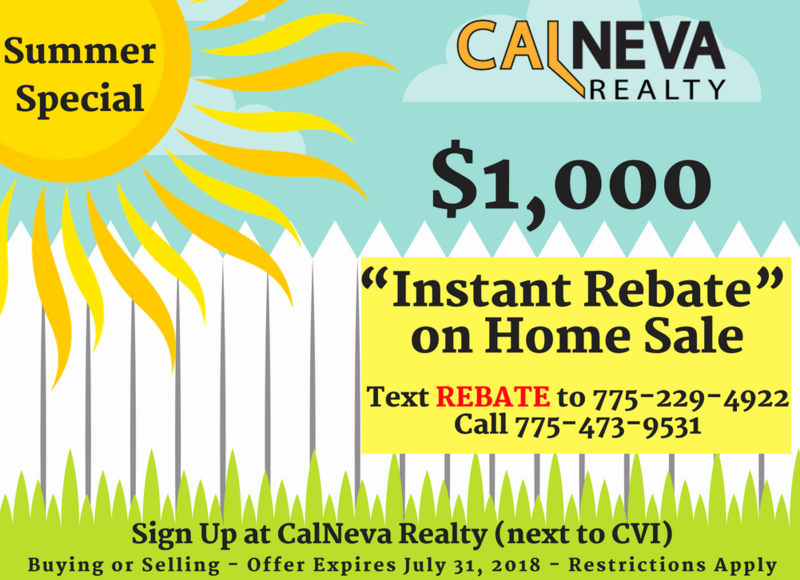 Can not be combined with any other CalNeva Realty offer. Purchase Contract “Acceptance Date” after July 1, 2018. Closing date must be between August 1, 2018 and November 30, 2018. Minimum total commission of 2.5% to CalNeva Realty.